I'm in the help business but I still struggle with this...do you? BlogHome » Blog » Blog » I’m in the help business but I still struggle with this… do you? 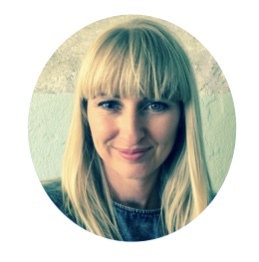 Janine Williams is the Co-founder of Support Crew, along with her good buddy Kelly Banks. 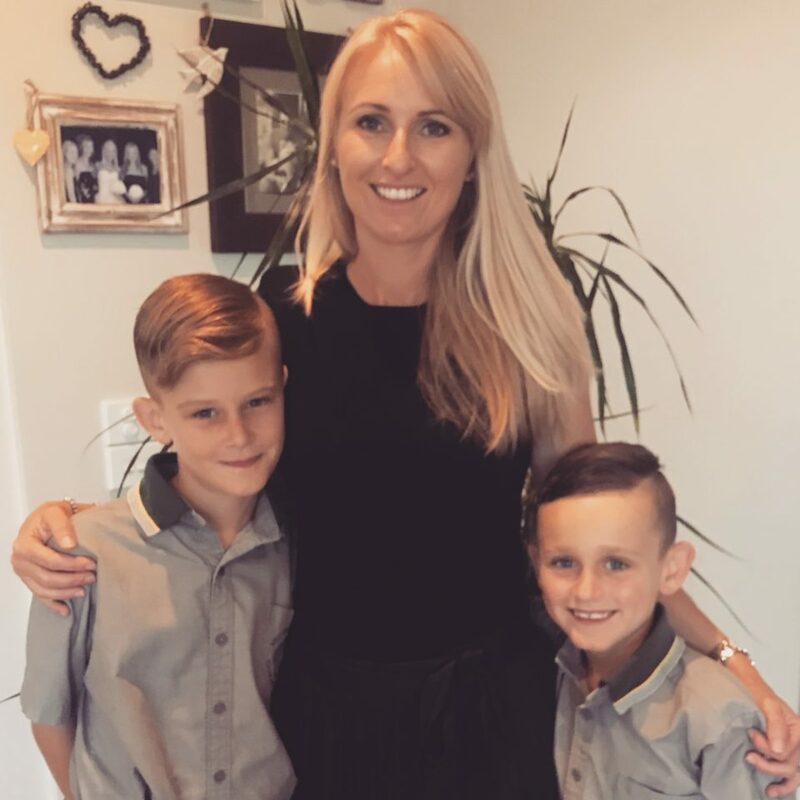 Janine has two gorgeous boys Connor, aged 9, and Ethan, aged 7. 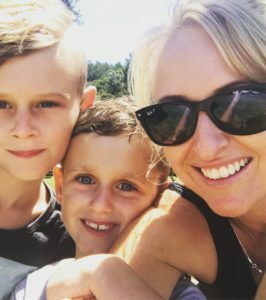 Janine openly shares what she struggles with the most, and what she’s committed to trying to do this year to make things just that little bit easier. Everyone’s had one of those days where you’re completely overwhelmed, stressed and you wish you had a fairy godmother who’d help with the school pick-ups, homework, walking the dog and sorting your dinner for you. And that was today right?! The funny thing is, deep down we usually know exactly what it is that we need help with – it’s just that we’re not that good at asking for it. 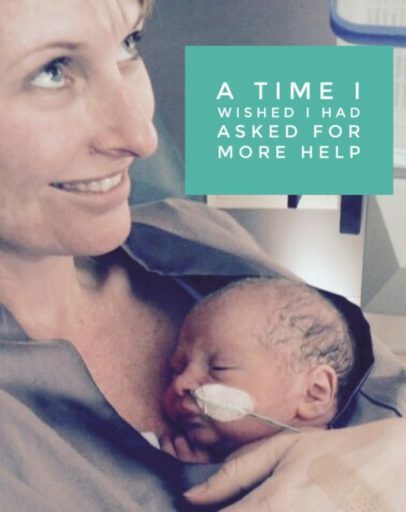 I’m fortunate enough to know that I can call on a friend, Granny or Nana to help out with my boys when the juggling gets tough, but that doesn’t make it any easier to ask for help, and sometimes the co-ordination of help is more difficult than the ask! Weirdly, I’m in the help business but asking for help is still a challenge for me. I don’t think it will ever go away – but I do want to make it easier! For me personally, I go through the motions of feeling guilty so I end up devising a plan that means I try and do everything and practically write myself off in the process. I also have a fear of failure that if I’m asking for help I’ve failed because I haven’t been able to cope on my own. The other fear I have is a little more obtuse! It’s the fear of rejection – that if I ask for help, people will say no. 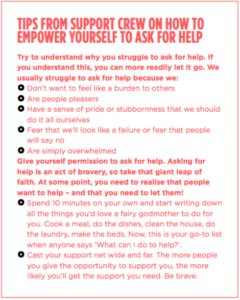 So I don’t ask for help, and instead tell myself that my current situation doesn’t warrant any help – and by not asking for help we can fall into the trap of making the ‘do it all’ situation our new ‘norm’. But we need to remind ourselves that if we are feeling stressed and overwhelmed, then we need to give ourselves permission to say “actually I do need help with getting the boys to swimming today.” Our fears can be quickly dissipated when our SOS is welcomed with a resounding ‘yes’ or a simple ‘I’d love to but I can’t today’ – what’s so scary about that?!! My pride is still intact and I feel supported, which is the best feeling! How do we make it easier on ourselves? So, I’m going to challenge myself this term, so that when the feeling of overwhelm shows itself and I feel myself needing a helping hand, I’m going to ask my Crew for help without internally complicating it. And I’ll just trust that my Crew will help if they can, and if they can’t, they will simply say so. What we often forget, is that more than often the law of reciprocation kicks in and we get to reciprocate by giving the other person a helping hand when they need it! As parents, let’s be brave and share the load where we can. We are often doing similar tasks or going to the same places. How about sharing after school activities – one week on and one week off with a friend? It takes a village to raise a child and to my Crew who are reading this, I’d love for you to ask me next time you need a helping hand, because I’ll be doing the same! So let’s create a ripple effect – so that together we can all make each other’s lives just that little bit easier. Check out these tips from Support Crew that were published in Little Treasures Magazine, Summer 2017. 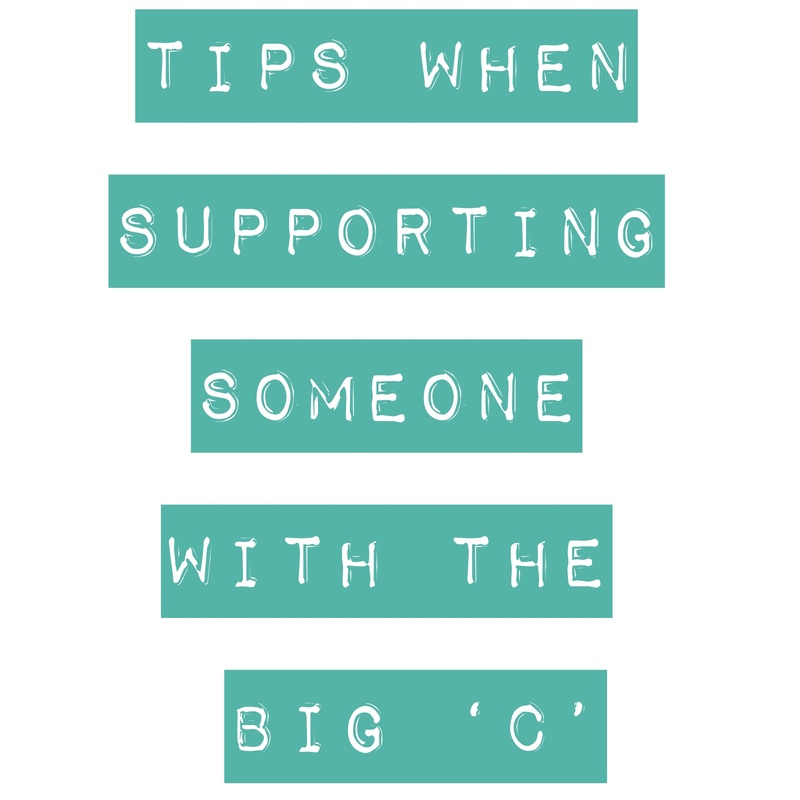 If the juggling and co-ordinating is too great, or you need that extra help, why not set up a private Support Page and invite the people in your Support Crew who are helping out anyway. It’ll save you heaps of time and reduce the number of phone calls, texts and emails. If you want to read about one of the inspirations for Kelly and Janine to start Support Crew, check out how Kelly’s journey to becoming a ‘Reluctant Caregiver’ started after her partner Randal was diagnosed with stage 4 bowel cancer.